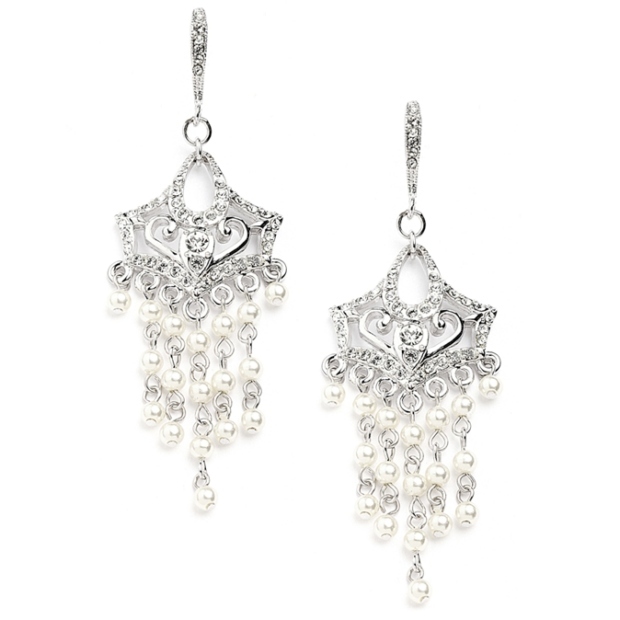 * Mariell' graceful Wedding Earrings have 3mm Ivory Pearls cascading from a vintage jewel encrusted Cubic Zirconia motif & bejeweled French wire. * Wear these 2 3/4" h x 7/8" w lacy Bridal earrings and adorn your wedding gown with Old Hollywood glamour! * Retailers and stockists, don't miss these absolutely breathtaking Wholesale Wedding Chandelier Earrings boasting a perfect marriage between vintage and modern jewellery. * These retro filigree bridal earrings with their lacy, delicate design offer antique charm paired with high fashion retro chic. * Our CZ jewelry is plated in top quality never-tarnish Genuine silver rhodium so your Brides can enjoy our products for generations to come! * These wonderfully lightweight earrings make sure your brides can dance the night away in these romantic earrings until they slip them off in the honeymoon suite!